For many people, the word mysticism conjures up occult, secretive rituals held after midnight in some dark cave. But true mysticism isn�t at all sinister or secretive, says author John Mabry, an Anglican-rite Congregational minister. In fact, mysticism is at the heart of an authentic Christian life. It is nothing more and nothing less than the pursuit-and enjoyment-of union with God, which is the goal of all Christian spirituality. Christian mysticism is the discipline of growing the soul into God�shedding illusory identities, deepening prayer, seeing God in all things, and acting as Christ in the world. Mabry�s great passion is to bring theology to everyday life by explaining complex ideas in everyday language that anyone can understand and find useful. 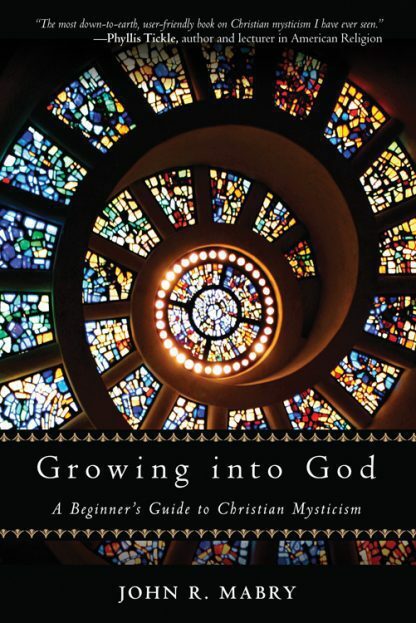 In Growing into God, he �demystifies� mysticism, providing a friendly and accessible entry point to some of the teachings, practices, and experiences of the Christian mystical tradition. Mabry explores the classic mystical journey, which begins with the Awakening of a unitive consciousness that experiences everything as Divine and interconnected. The journey continues with Purgation, in which we empty ourselves of illusion; Illumination, in which we begin to see God in all things and all things in God; and, finally, Union, in which we marry our lives with God�s life. Our hands become God�s hands, our lips become God�s lips, our touch becomes God�s touch, in order to bring help, comfort, and healing to the world. John R. Mabry is a pastor, teacher, musician and writer. He holds a master's degree in creation spirituality from Holy Names College and a doctorate in philosophy and Religion from the California Institute of Integral Studies. John has served as editor for Creation Spirituality magazine and Presence: An International Journal of Spiritual Direction, and as managing editor for the Episcopal Diocese of California's Pacific Church News. John currently serves as pastor of Grace North Church in Berkeley, Calif., an Anglican-rite Congregational parish. John is the Director of the Interfaith Spiritual Direction Certificate Program at the Chaplaincy Institute for Arts and Interfaith Ministry, where he also teaches world religions and interfaith theology. He also teaches for the master's degree program in Interfaith Spiritual Guidance at the Institute of Transpersonal Psychology in Palo Alto, Calif. John is the author of numerous books on spirituality and spiritual guidance, including Faith Styles: Ways People Believe, Noticing the Divine: An Introduction to Interfaith Spiritual Guidance, and The Way of Thomas: Nine Insights for Enlightened Living from the Secret Sayings of Jesus. He also writes fiction, poetry, and music. John lives in Oakland, Calif.